Singapore shipbuilders face a likely prolonged period of low rig orders, echoing the contracting lull post the 1985 oil crisis. Referencing historical scrapping trends, we find that unless scrapping picks up significantly, a balancing of the jack-up fleet might not occur even by 2020. A new rig-order boom may only happen well thereafter. Higher oil demand alone is insufficient to increase rig orders and KEP/SMM will likely reset to a new earnings normal in the meantime. Prefer KEP over SMM. Maintain MARKET WEIGHT. No rig orders to date. Since the downturn in 2014, a total of 42 rig orders have been placed, with 35 in 2014, 7 in 2015 and none in 2016. With annual E&P capex globally slashed by 26% per year for two consecutive years – the first since the 1980s – rig utilisation has plummeted to 61% owing to the dearth of work. The previous rig building boom of 2004-14 saw the fleet expand by 36%, and with another 191 rigs awaiting delivery through till 2020, the rig market is in serious oversupply. Of these, only 24% have contracts in place. As such, no new orders have been placed to date. Parallels drawn to the 1980s. Market had previously drawn parallels between the current crisis and that in the 1980s. High oil prices saw a rig-building boom spanning 1977-82 that saw jackup (JU) and semisubmersible (SS) fleet double. This was followed by the oil crisis of 1985, which saw utilisation plunge from 100% to ~60%. Rig orders entered a long lull lasting nearly two decades, with 80 units ordered over 1986-2004 (19 years) vs the 357 units ordered in the 1977-82 boom (six years). Oil demand growth alone not enough to bring back rig orders. Given the current rig oversupply, rising oil prices and growing oil demand alone are not enough to stimulate another rig-building boom. Over the 1986-2004 period, oil demand grew at a 19-year CAGR of 1.7%, or an average of 1.2mb/d p.a. This compares with annual growth of 1.3mb/d that IEA forecasts for 2016. Over the 1986-2004 period, the JU/SS rig fleet declined 12% as rig supply adjusted to the new normal. It took the coming of China’s demand for oil in 2000 and a low interest rate environment to start the boom of 2005-14. JU attrition over last slump was 23% of fleet. 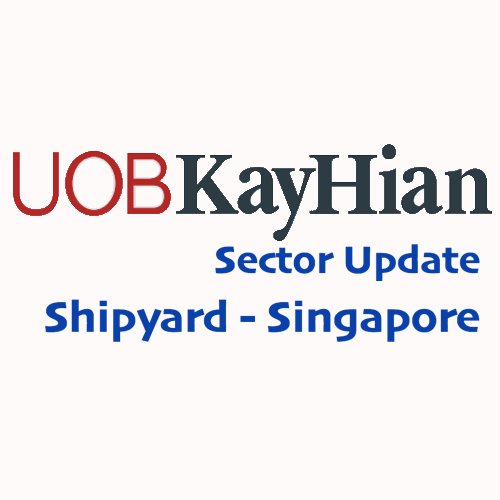 We focus on JU rigs as Singapore shipyards are predominantly JU builders. During the building lull, a total of 103 units, or 23% of the JU fleet, were scrapped/converted. Coupled with deliveries of ~50 over the period, net attrition was 53 units or 12% of fleet. This serves as a useful reference point to the extent the JU rig market corrects after a period of oversupply. Total scrapping to balance market at 195 units; scrapping since 2014 only at 36. Applying net attrition of 12% to present times, we estimate a total of 195 units have to be scrapped for market balance after netting delivery of 126 rigs over 2016-20. Since 2014, only 36 units have been scrapped. If the market were to balance by 2020 this entails scrapping of about 31 units/year, while a 2018 balancing would require about 52 units/year. Scrapping in 2014/2015 was 10 and 14 respectively, while 2016 ytd is only 12. Unless scrapping gathers pace, a market balance in 2020 looks distant. Close to 85% of stacked JUs have to be scrapped for market balance. Rig owners rigs as of end Apr-16 was 187 for JUs. If all units scrapped stemmed from stacked units are most likely to retire rigs that have already been stacked. The global count for stacked alone, this would entail attrition of 85% of the stacked fleet. The next rig-building boom may not happen even if market balances. A look at SMM historical trend further shows that when JU supply balanced out around 1996, a rig building boom did not start until 2004. The same could be said of present: even if market balances by 2020, we might not witness another rig-building boom till much later. A long winter for rig builders. Singapore shipyards are likely to undergo a long winter in rig orders. During the building lull of 1986-2004, rig orders averaged 4 units/year. With the (x) emergence of China as a new competitor, on top of South Korea, a three-way fight for 5.00 orders will be likely. That said, given Singapore’s reputation for on-time and on-budget 4.50 delivery, they are likely to secure the lion’s share of orders. However, an average of 4 units/year is a pittance to the average of 34 units/year during the boom of 2005-14. O&M earnings will reset to a new normal. Given the likely slowdown in rig building, Singapore shipyards’ earnings will likely reset to this lower normal. The heyday earnings of yesteryear might be a thing of the past for a substantial period. Prior to the rig-building boom in 2004, Singapore shipyards traded at an average P/B valuation of 1.23x. This might likely be the new valuation multiple going forward. Keppel and SMM currently trade at 0.85x and 1.27x respectively. Prefer Keppel over Sembcorp Marine (SMM). With the rig building business resetting to a new normal, Singapore shipyards will have to depend on other earnings stream. In this aspect, we prefer Keppel, as it can lean upon its property, infrastructure and investment businesses. SMM’s earnings will likely correct to a new normal, as it relies more on conversion and fabrication jobs to offset the decline in JU rig orders. O&M margins for both will likely remain pressured. For SMM, this will be more acute due to ownership of a yard in Brazil, which remains a challenging market for the foreseeable future. Going forward, we expect repair and conversion work to form the earnings base, with rig building to provide the earnings boost. Our recommendation remains unchanged for Keppel (HOLD / TP: S$6.40) and SMM (HOLD / TP: S$1.27). No change to our earnings forecasts for KEP and SMM.